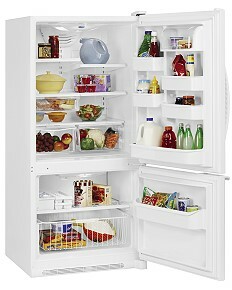 Overview: The Amana ABB1921DEW Bottom Mount Freezer Refrigerator was recently named a Consumer Report's Best Buy. Unlike most bottom mount freezer refrigerators, this Amana Refrigerator has a swing out door which we found much more convenient and preferable to the usual bottom pull out drawer. In similar models we found that the compressor was too small to adequately refrigerate the entire unit, but we were happily surprised to find that no longer seemed to be the case. Style:The style of this unit is simple in nature. We loved the basic white which we found would be quite attractive in almost any standard kitchen decor. Capacity: This Amana Bottom Mount Freezer Refrigerator has an 18.5 Cubic Foot interior. It is well designed inside giving you ample storage space. Additionally, the swing out freezer door helped give a lot more usable space to the freezer. But obviously, if you have bad knees or hate bending down to see what's in the freezer the Amana ABB1921DEW may not be for you. The four adjustable door buckets came in quite handy as well as the adjustable glass shelving, which allows you to customize the interior space as you see fit. Notable Features: One feature that stood out was how quiet it operated. This model has the Amana Softsound/Quiet Package which is one of the more aptly named features. Colors: One of the few disadvantages to this particular Amana refrigerator was that it only comes in white. Although the ABB1922FEW comes in Black and is close to this model, it didn't have the swing out door that sets this model apart. Dimensions: Its dimensions are: DEPTH – 29 5/8in, WIDTH – 30in, HEIGHT 66 7/8in. MSRP: This model has been DISCONTINUED but its original MSRP was $899.99. Don't be concerned if this model was interesting to you as there are still many bottom freezer refrigerators on the market.